Now that Google Voice’s voicemail can be added to your existing phone number (giving you great features like searchable voicemail, free voice transcription, custom greetings, and email/SMS notification), you may have noticed that callers have to wait through way too many rings before your Google voicemail picks up the call. 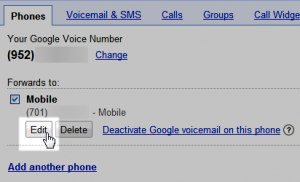 Note: This guide is only for users who have replaced their voicemail with Google Voice. If you’re using Google Voice to forward calls to multiple numbers, this will mess that up. Step 1: Log into Google Voice and click ‘Settings’ in the top right corner of the window. Step 2: Click the ‘Edit’ button under your current cell phone number. Step 3: Click ‘Show advanced settings’. Step 4: Under Forwarding Options, select ‘Go straight to voicemail’. Click Save and repeat this process for any other phones you have in Google Voice. From my testing, my phone now goes seamlessly to my Google voicemail without any extra rings in between. 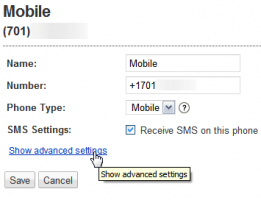 The nice part about this trick is that you’ll still be able to send/receive SMS to your phone (which would be lost if you simply removed the phone from the forwarding list). Have any tricks for getting the most out of Google Voice? Share them in the comments!